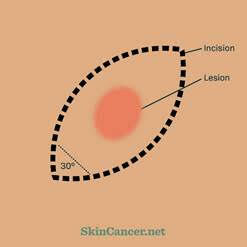 An excision refers to the removal of a skin lesion by completely cutting it out. A common reason why skin lesions are excised, is to fully remove skin cancers such as basal cell carcinomas, squamous cell carcinomas or melanomas. If the cancer is not cut out it may spread to the surrounding skin and to other parts of the body (metastasise). Another common reason for an excision is a mole which has been changing or which looks irregular. Lesions may also be removed for diagnosis, cosmetic appearance, if it is symptomatic (for example if it is tender or keeps catching on clothing), or to remove an inflamed or frequently infected cyst. A conservative excision involves the removal of the growth and a small amount of normal skin surrounding the growth. It is a simple procedure performed in our rooms under local anaesthesia. After preparing the excision site by draping you with sterile drapes, the area will first be marked with a coloured pen, then cleaned with chlorhexidine. Local anaesthetic will then be injected into the area surrounding the skin lesion to be treated. This causes an uncomfortable burning sensation which will last only a few moments. This will make the skin go numb so no pain should be felt during the procedure. You may feel a pushing or pulling sensation but this should not be painful. The skin will then be cut and the growth removed with a surgical knife. After the procedure is performed, an antiseptic cream and waterproof dressing will be placed over the wound area and you will receive detailed postoperative wound care instructions. The growth will always be sent to a pathology lab for microscopic examination by a dermatopathologist (a pathologist or dermatologist specialized in the microscopic examination of skin disease). The stitched wound heals by itself over 1 to 2 weeks, depending on the location of the treated area. 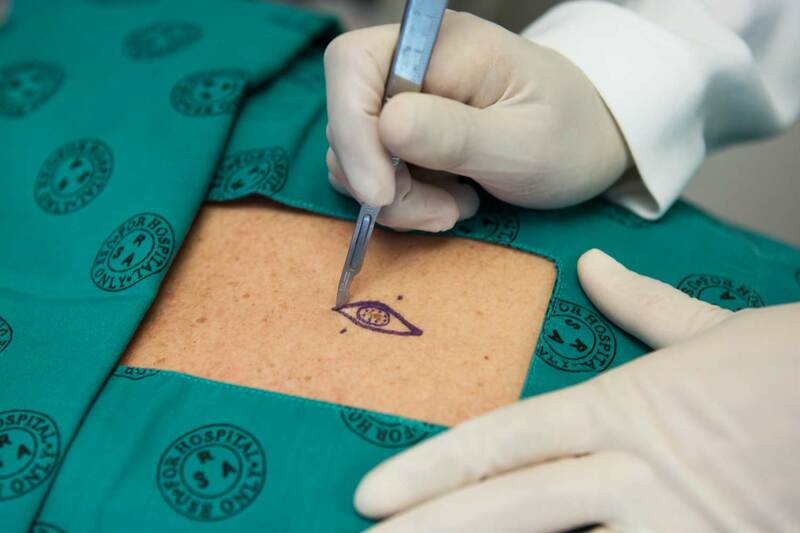 Thereafter, if non-absorbable sutures have been used, they will be removed. It is important to limit any stretching of the area of the excision during this time to prevent pulling on the sutures. Tension is the enemy of a good scar! If the stitches are torn apart then the wound will heal poorly with a nasty scar. Unfortunately this often means limitation of exercise, weight training and practices such as yoga and pilates during this time, particularly if the excised area is near a joint. Most patients do not have a great deal of pain after the procedure. If you experience tenderness, paracetamol should be sufficient to provide relief. We will provide you with detailed post-procedure care instructions. it is impossible to cut the skin without scarring in some way. All surgery to the skin will lead to some form of scar. For the majority of people the scar will initially be red and raised but usually reduces and fades over a year, in colour and size over several months. However, the scar may become thickened, lumpy, red and itchy, this is known as keloid or hypertrophic scar. The risk is higher on the shoulders, upper back and chest or if you have a family history of such scars. If this happens, we have multiple methods of treating this complication. At Atlantic Dermatology and Laser, we believe that our scars are our signatures so rest assured, we will do our utmost to make it a neat and discreet one!